So I got a new credit card this month, and I totally needed to rack up enough points to be eligible for some Qantas Frequent Flyer freebies. At least, that’s the excuse I’m going with, since somehow I got 10 books in the last 2 weeks?! I’ve already read 5 of them, and on my 6th, so at least I am being productive… RIGHT? 1. Archivist Wasp by Nicole Kornher Stace was totally getting some buzz on both The Midnight Gardens and The Book Smugglers, so I *had* to have it. As far as I can tell, it’s about a girl who hunts ghosts to remain an Archivist. To be honest I know very little about it, but I trust the opinions of the ladies who have been heaping the book praises so I’m very excited to check it out. 2. Armada by Ernest Cline was from Netgalley, I was so ecstatic to be approved for for title! I just finished it this afternoon and holy nerd-reference galore batman! It was a fun, quick read. 3. Way Down Dark by James Smythe was recommended by The Diva Booknerd, and I loved this gritty scifi. Full review here. 4. 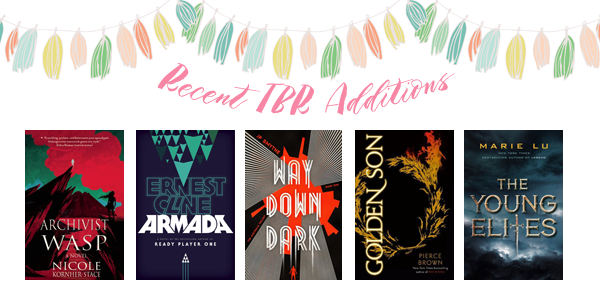 Golden Son by Pierce Brown was pretty much an instant purchase the moment I finished Red Rising – 11 out of 10, a flawless sequel! Review scheduled to be published tomorrow. 5. The Young Elites by Marie Lu was acquired on Kindle because I am in the mood for some fantasy, and I have never read a Marie Lu book so why not? 6. Ink and Bone by Rachel Caine has an awesome premise: The Library of Alexandria still exists and is pretty much the most powerful force in this world! The setting did not disappoint, but I had doubts about the characters – I still really enjoyed it, so review to come this week! 7. 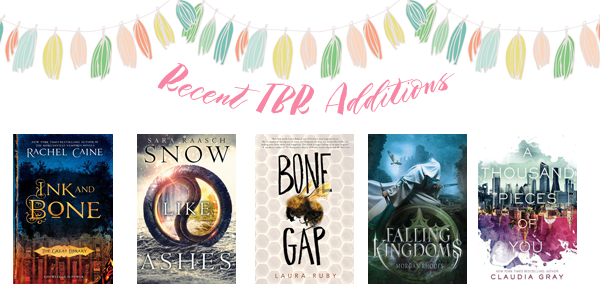 Snow Like Ashes by Sara Raasch was purchased because I saw Kynndra give it good ratings and she has awesome book taste – plus a world centred around seasons ala Game of Thrones? Yay! 8. Bone Gap by Laura Ruby I bought through Book Depository because there’s no Kindle version, it’s a fairy-tale for adults which is my favourite genre of books ever. I started reading 9. Falling Kingdoms by Morgan Rhodes today and omg why did I not get onto this bandwagon earlier? I am snobby about high fantasy in YA because the worlbuilding is always a bit thin, but this book is incredibly entertaining and has the potential to be meaty. I am so ready to love this series, you guys. Finally, A Thousand Pieces of You by Claudia Gray was a buy because of the comparison to Cloud Atlas, one of my favourite movies last year. So have you all been as terrible as I am in terms of bookish self control? Share your list! If you have read any of the above, please let me know what you thought of them/link me to your review! I hope we both enjoy the book, I’m reading Falling Kingdoms now but that one is next on my to-do list, Ooo, now I must try to find your review on goodreads. Great list! I’m envious that you got your hands on Armada for free. So glad you enjoyed it! A Thousand Pieces of You has such a pretty cover. The book itself was meh, but I do plan on picking up the sequel! I just got lucky with Netgalley that day haha, I hope you’ll enjoy Armada when you read it. Aw sorry to hear A Thousand Pieces of You didn’t quite work for you, hopefully I have better luck haha. Love your blog design… it’s soooo pretty!!! Golden Son was soooooo good, I squealed when I got sent an ARC of that. I am so desperate to get my hands on the third book. I hope you enjoy all of these! 🙂 Here’s my TTT! Golden Son is amazing omg I can’t deal with that ending though haha. I love your excuse for buying books- that’s so something I’d say. I have an Amazon card and I save the point for Christmas, so every time I buy something I justify it as a sorta saving money for presents. *nods* We are totally buying books to save money haha. I WISH I could afford to spend more on books. Lately I’ve been really limiting myself. I haven’t read any of these, but I’m somewhat interested in Red Rising. Thanks for sharing! The Young Elites is a nice fantasy read though I feel like Marie Lu can do better! Or maybe my expectations were especially high since her Legend trilogy was amazing and legendary itself. I really need to continue the Falling Kingdoms series because it seems like the world is only going to get more complex! I really need to get my hands on the Legend trilogy – everyone seems to love it! Falling Kingdoms has so much potential to be great, I’m so excited to read the next books! I have heard great things about A Thousand Pieces of You. Hope you enjoy it! I hope so too, I have been hearing mixed things but I have high hopes haha. *whispers* Your graphics are so so pretty. Given that books are partially helping me earn my way to a free flight to my next holiday, they are indeed WONDERFUL hehe. Snow Like Ashes sound so good, right after my Falling Kingdoms binge! Ink and Bone was so lovely setting wise, hope you will like it! Great list!! I just finished Ink and Bine too – wasn’t the premise incredible? 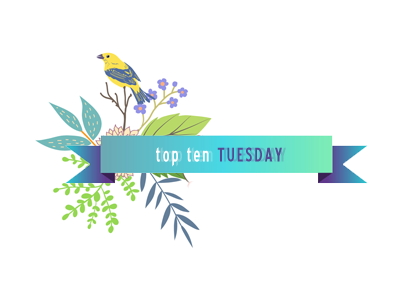 There are a few more on your list that I am drooling over as well…. LOVE your site design and graphics! So pretty. Thanks! I just reviewed Ink and Bone and I adored the setting! Glad you like the graphics as well 🙂 thank you for stopping by! Oh geez – Ink and BONE. I obviously need to work on my proof-reading….. The only books I’ve read no this list are A Thousand Pieces of You and Bone Gap haha, but I hope you enjoy all the books you got recently! I’ve seen Armada around and it sounds interesting, but I’m afraid all the Batman references would go right over my head! The references aren’t of Batman, I think Batman was mentioned once – but it’s mainly 80s-90s games and scifi and apocalyptic movie — A great read if you’re into that sorta thing! And all of the books have had such awesome cover lately, I love the cover of A Thousand Pieces of You’s sequel even more! Snow like Ashes is beautiful – if you’ve read Lumatere Chronicles, it hasthe same feel!